Online Banking System provides is specifically developed for online banking for Balance Enquiry, Funds Transfer to another account in the same bank, Loan details, Request for cheque book/ change of address/ stop payment of cheques, Mini statements (Viewing Monthly and annual statements). The Traditional way of maintaining details of a user in a bank was to enter the details and record them. Every time the user need to perform some transactions he has to go to bank and perform the necessary actions, which may not be so feasible all the time. It may be a hard-hitting task for the users and the bankers too. The project gives real life understanding of Online Banking System and activities performed by various roles in the supply chain. Here, we provide an automation for banking system through Internet. Online Banking System project captures activities performed by different roles in real life banking which provides enhanced techniques for maintaining the required information upto- date, which results in efficiency. The project gives real life understanding of Online Banking System and activities performed by various roles in the supply chain. This Project investigates the entry threshold for providing a new transaction service channel via the real options approach, where the entry threshold is established by using an Internet banking system designed for the use of normal users(individuals), Industrialists, Entrepreneurs,Educational Institutions(Financial sections), Organizations and Academicians under transaction rate uncertainty. If a wrong password is given thrice in succession, that account will be locked and the customer will not be able to use it. When an invalid password is entered a warning is given to the user that his account is going to get locked. After the valid user logs in he is shown the list of accounts he has with the bank. On selecting the desired account he is taken to a page which shows the present balance in that particular account number. User can request for the details of the last ‘n’ number of transactions that he has performed. A report can also be taken of this. User can make a funds transfer to another account in the same bank. User is provided with a transaction password which is different from the login password. User can transfer funds from his account to any other account with this bank. If the transaction is successful a notification should appear to the customer, in case it is unsuccessful, a proper message should be given to the customer as to why it failed. User can view his monthly as well as annual statements. He can also take print out of the same. Administrator can take a back up of the database for every instance that is happening, periodically. FAQ section is also included for end users benefit. Administrator: He is the super user who can add new customers into banking system, and assigns corresponding username, password, account type and other details. When any customer cancels his account from the bank, he can delete their account and stop the transactions immediately. He can generate different reports. He also takes the system backup. Customers: After logging in customer can request for balance enquiry in his account, Funds Transfer to another account in the same bank, Request for cheque book/change of address/stop payment of cheques, Mini statements (Viewing Monthly and annual statements). 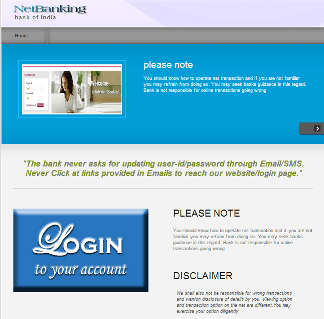 1) Login Process: This module allows valid customers to access the functionalities provided by the bank. 2) Balance Enquiry: This module maintains the balance details of a particular account. 3) Update Profile: This module allows the customer to update profile of their account. 4) Funds Transfer: This module allows the customers to transfer funds from one account to another within the same bank. 5) Change of Password: This module allows customers to change their password. 6) Mini Statements: This module allows customers to view their transaction details. The present system is developing as web application. In future we would like to develop it for portable devices like cell phones, wap or GPRS connections.